Back in the Kanban Flow! KanbanFlow is an interesting way to organize the flow of your work and home life. I’m back like the Phoenix from the ashes–or the busy teacher in graduate school. Summer is here and I’m in Japan for the summer. I am taking two online graduate classes through Syracuse University as I slog along the path to becoming Juan the Samurai School Librarian. My Samurai Mind notebook is still a lifeline. I pour everything in there now, including my graduate classes. Normally, I would suggest keeping separate notebooks but this school year I have been in time survival mode. The boring-est of graduate class notes are mixed in with inspirational quotes. Sometimes the graduate stuff overwhelms the inspiration, but the inspirations are like little nuggets that keep the process fun. Once the unit or class is finished, if the information from the classes are not inspirational, I put a huge X across the page once the class is finished. This is my Writing board. I’ve written a lot more since I started this board. My newest summer toy is a website called KanbanFlow. It is my latest time management tool. I’ve just had it for a week. Basically, I can add tasks to several columns: to do, do today, in progress and done. I can move the tasks you create from one column to the other. The “in progress” column just has room for three tasks, because in reality it’s hard to do more than three tasks at once. For me, it serves as a reminder of what I am actually doing. In the world of Facebook, notifications, text messages, etc I really need the reminder of what I am doing. When I start to wander to Facebook, I look at the chart and remind myself of what I’m actually supposed to be doing. A Pomodoro counts down from 25 minutes. This is the stopwatch option that allows you to measure how much time you are working on a task. It can be motivating. 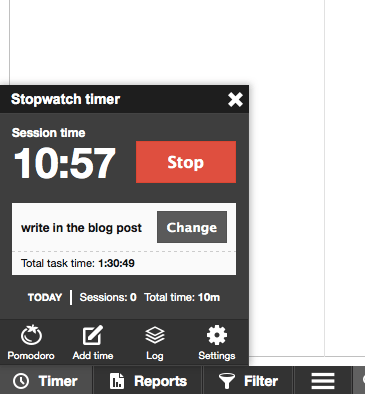 If I really want to get fancy, the site lets me set a “Pomodoro” for the task that I am currently on. Usually it sets a countdown timer for 25 minutes. At the end of the time and the effervescent ring, I can claim the time or “pomodoro” if I’ve been on task or I can deny it if I have been off-task (i.e. looking at Facebook). The nice aspect of this is that the time you claim adds up and gets added to your task card. This way you can track the amount of time you’ve been on a certain task. Kanban is a nice way to ”gamify” productivity and creativity. When I create cards, I can create subtasks within the task. This is a great feature that allows me to guide myself through various projects. For example, I am currently studying three languages: German, Tagalog, and Japanese. When I click on the study Japanese card, I can check off little subtasks: study IKnow, surusu, Jpod101, read fun manga/book, watch fun Japanese stuff on Youtube, etc. The checklists lets me know where to go and also where I have been. When I get done with a task, I can move it to the “Done” column. In the morning or when ever I look at my kanban board again, I can move the tasks that I do repeatedly back to the “To Do” column. The kanban board encourages me to accomplish more while being more flexible. There is something very pleasing about moving a task to the Done pile. I’ve studied a whole lot more of the different languages this way. On the other hand, having a board to look at gives you a lot of options to choose from depending on your energy level and interests. If I get tired of writing my blog, I can move to do a teeny, tiny language lesson. KanbanFlow allows you to create several boards. I call one the Masterboard, where I can see the various kinds of task that I am interested. Then I have other boards for the different contexts I find are important to me: School (everything from planning lessons to individual student concerns), Library (graduate studies and planning to create a school library), Writing, Union/Advocacy, and Family/Home. I have the Premium (5$/month) version but you can just play around with the free version to see if it helps you with your productivity. I also didn’t shop around a lot, so this isn’t an endorsement. I needed something to help me harness my time and options and I ran with it. I also have an app called Kanban for One which works on a similar principle but I didn’t like that I couldn’t synch it across devices. However, I still use it for times when I can’t access the internet–long plane rides, etc. The whole kanban process was originally done on paper strips. Yay sticky notes! and white boards! I have 5;47 remaining to finish a snappy conclusion. Move it to the right and get it done with kanban!